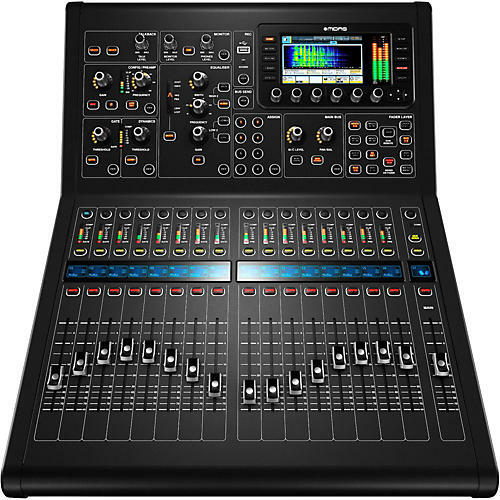 The goal for the MIDAS M32R Digital Mixing Console was to combine the best of classic British console designs with advanced modern technology to completely redefine what a rack mountable digital desktop mixing console can offer. Drawing on inspiration from luxury and high-performance cars, MIDAS set out to design the M32R with innovative technological advancements while simultaneously maintaining the feel, essence, and intangible qualities of their cherished brand. Many different construction materials were tested. Countless design variations were explored. And in the end, a styling was chosen that represented the perfect marriage between aerodynamic artistry and uncompromising performance, and the result is the 40-input M32R digital console with 16 MIDAS PRO microphone preamplifiers and 25 mix buses. A true statement of MIDAS excellence. While the MIDAS M32R design, styling, and construction will surely turn a lot of heads, it’s the sound that matters most to engineers and performing artists. And that’s where M32R shines even brighter – as the latest in a long line of pristine-sounding MIDAS consoles, it descends from a celebrated lineage that literally set the standard in electrical design and sound quality. Ever since MIDAS consoles first found fame 40 years ago with acts like Billy Joel, Yes, The Beach Boys, Pink Floyd and others, the MIDAS legacy has always been about uncompromising quality and the ultimate in sound reproduction. Whether you come from an analog mixing background, or are accustomed to using other digital consoles, your first experience with M32R has been engineered to be intuitive, fluid and straightforward. The brilliance of the M32R is its simplicity and workflow. Tactile controls allow smooth adjustments to critical elements as the mix progresses while the TFT screen keeps you informed every step of the way. This integration of tactile controls, motorized faders and the array of LCD and TFT displays makes the M32R experience the premiere solution for Live Sound, Broadcast, Studio Recording and Post Production applications. M32R changes the game by completely rethinking what is possible in a digital mixer. An intuitive workflow coupled with a fully interactive user interface ensures immediate familiarity and instills confidence. Advanced engineering and meticulous design deliver stellar sonic performance at an extremely affordable price – changing the game entirely.